I’m going to be breaking from tradition here for this week just for a bit to pay some respect to Jules Bianchi in light of his horror crash this weekend. So who exactly is Jules Bianchi? Just a little bit of background information (at the risk of boring those who already know – look away now), Bianchi is a 25 year old French driver who currently drives for the Marussia team. He scored his first points in F1 at this year’s Monaco Grand Prix. He has been a test driver for Ferrari and Force India. He has racing in his blood with his grandfather Mauro Bianchi being a three-time World Champion in the GT Category, and his uncle being a winner of the 1986 24 Hours Le Mans, and competed in 19 F1 Grand Prix’s between 1959 and 1968, with a podium finish in Monaco. So that’s his basic background info covered, now lets move on to what happened in Japan. The race was always going to be manic thanks to Typhoon Phanfone moving in over that weekend (the Japanese Grand Prix is historically plagued by these kinds of issues thanks to timing and so on), and there were concerns about racing leading up to the weekend. However, the show must go on, and so the race was to continue as planned. The free practice sessions and qualifying were largely unaffected by the weather, and Sunday was the first time the cars would run in wet conditions. Most seemed unphased by the weather, despite it looking fairly ominous at the start, and the race was led off by the Safety Car to ensure no major incidents. Fernando Alonso’s car decided it had no intention of racing in that weather and came to a stop in lap 4, leaving the Spaniard stranded (ironically, not unlike he is currently in terms of a drive for next year – allegedly). For the most part, the race continued as normal without much chaos, and at one point was drying up pretty nicely to allow for some decent racing. 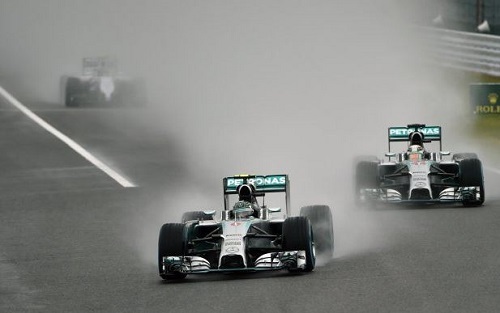 Hamilton took advantage of the confused weather to pull out a brilliant overtake on Rosberg, taking the lead of the race and extending his lead in the World Championship. However, towards the end of the race, the weather started to move in again, and eventually, the track became too slippery, causing Adrian Sutil to spin off into a wall. Sutil’s accident was the unfortunate catalyst for what happened next, as his car was wedged so tightly into the wall that a crane was called for to remove it. Now what happened next is a mystery to me in that I have not seen the footage (not from a lack of social media brandishing it about, but purely because I do not want to witness something so tragic), but I do know that Bianchi’s car suffered the same fate as Sutil’s in that it slid off the track, but instead of hitting a wall, he hit the crane. For a few moments it seemed as though no one really knew what had happened as FOM cameras were recording from the other side, and so had not captured the incident. Most assumed that the flags were for Sutil. Suddenly, people started to realise that Bianchi was not on the track, and the medical car was deployed alongside the safety car. Again, as nothing had been reported, I assumed the medical car was for Adrian. 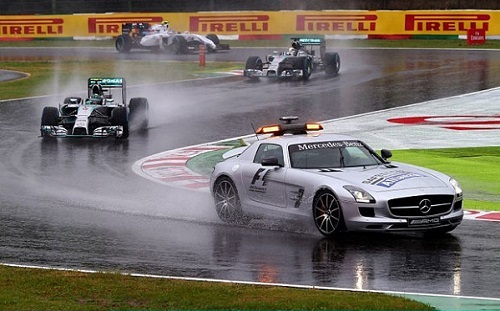 Only once the race had been red flagged did I realise that something was horribly wrong. Hearing the news of Bianchi’s crash shook me up, as I was uncertain as to how someone would be able to survive such an impact. As Bianchi was rushed to hospital, more details started to emerge and pieces started to fall into place. Reports started to emerge with the news that Bianchi had sustained severe head injuries, and was undergoing emergency surgery. We have since heard that he is critical but stable. There was a winner and a podium ceremony at the race, but that seemed irrelevant to even the podium finishers as the world held it’s breath over Jules condition. We are still holding our breath. It has been so good to see how the F1 community has united over this tragedy, but I am disheartened by how many people, seemingly desperate to break the news first, have been spreading unconfirmed reports and horrific footage. It is neither necessary nor decent and has caused me to question why we are so desperate to be the first with the news in this social media age. I’m not going to lambaste people over this, it’s not my place, and frankly what you share is your prerogative. I would just ask that you exercise some restraint, and publish confirmed news and reports rather than blind speculation, as some form of respect to his family as well. 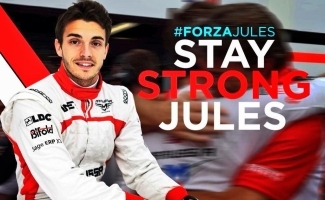 #ForzaJules. The F1 world is behind you, and we are all hoping and praying that you pull through this.